Molly and Joe both carried butterfly nets all day, hoping to be able to tag an adult monarch. 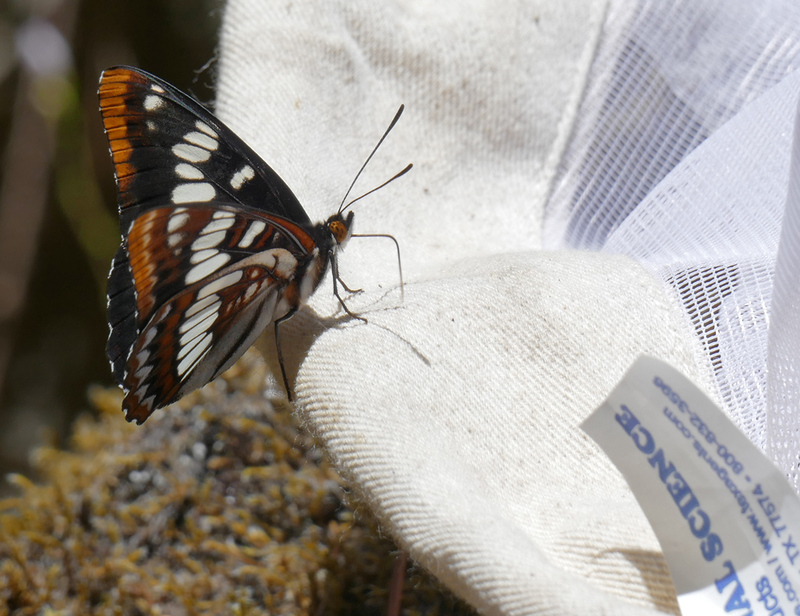 This Lorquin’s admiral was the only butterfly to make contact with a net. It must have found something tasty on the net and joined us while we ate lunch on the banks of Coal Creek. Ever since our trip to Coal Creek Bluff at the end of March (see First Flowers at Coal Creek Bluff), John Koenig and I had been looking forward to a return visit. Now that I knew the purple milkweed (Asclepias cordifolia) was emerging from its long winter dormancy, we wanted to get there as soon as possible. On Monday, May 7, we headed down to the Rigdon area along with Sheila Klest. We were very happy to drive out of the fog into a beautiful sunny day. Unlike our last trip, we were all prepared with extra shoes for walking through the creek. It was lower than in March but still not crossable without getting wet. With suitable footgear, the crossing hardly slowed us down. It was difficult to spot the milkweed in some areas where there were similar colors to still brownish purple leaves and whitish branches mimicking the old stalks. There are several milkweed plants in the foreground of this photo. After discovering new sites for purple (or heartleaf) milkweed (Asclepias cordifolia) in the Western Cascades last summer, my main goal for this spring and summer is to explore these lower elevation meadows in the Rigdon and North Umpqua areas of the Western Cascades for more milkweed sites—and hopefully more monarch sightings. Several weeks ago, John Koenig, Sheila Klest, and I tried to get to what I named “Coal Creek Bluff” last fall on my first visit there (see Final Outing of 2017). We drove across a thin layer of snow on the bridge across Coal Creek but were immediately stopped by a tree across the road. 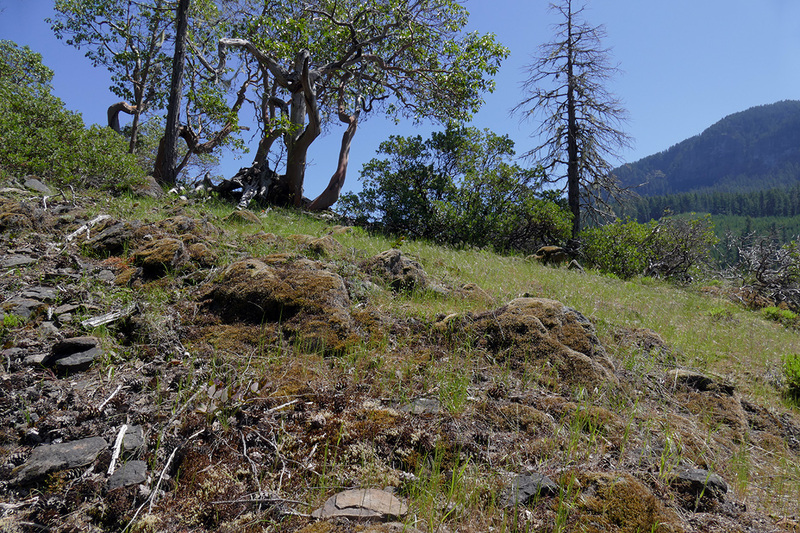 So we changed our plans and went back to “Monarch Meadow” and “Many Creeks Meadow”. John hadn’t been to Monarch Meadow, and Sheila hadn’t been to Many Creeks Meadow. It was an enjoyable day, and things were a little further along than the earlier trips I posted about most recently, but it was still quite early, so not much to report yet. 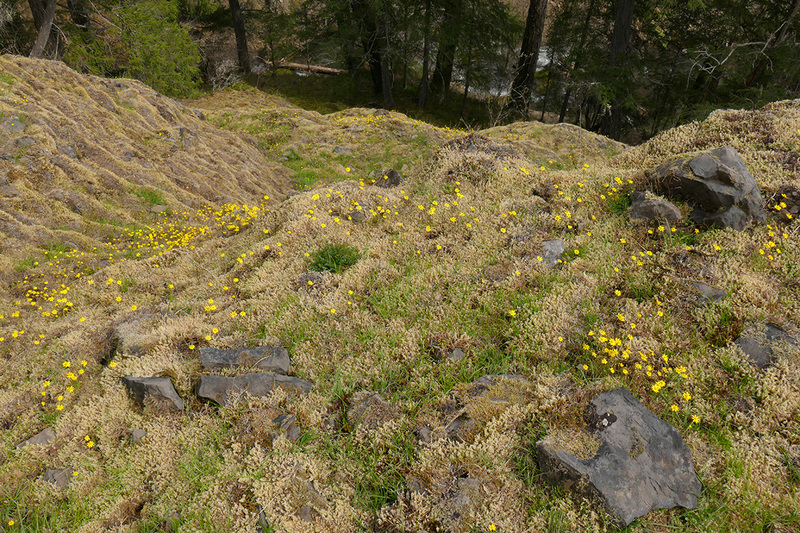 Gold stars light up the steep slope near the base of the open area. A glimpse of Coal Creek can be seen through the trees below. With the continued warm weather of late October, I made one final trip to the Rigdon area south of Oakridge to look at another interesting spot. 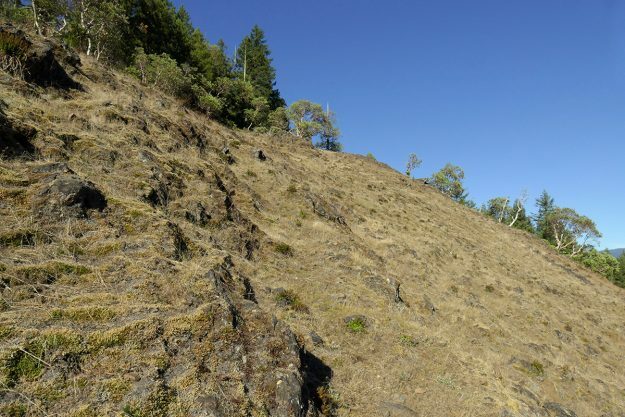 During my many trips up Coal Creek Road 2133 to get up to high elevation sites in the Calapooyas, I had often caught glances of an open slope on the far side of Coal Creek. I’d wondered for years about this intriguing spot, so it seemed like the right time to figure out how to explore it. On October 31st, I followed the route of my previous trip (see http://westerncascades.com/2018/01/27/further-low-elevation-meadow-exploration/previous post) but turned south off of Road 200 onto Road 210. I’d never been down this road before, so I wasn’t sure whether it was even driveable. It actually was in good shape for a while, and a gate across it was open, but I decided to park at the gate anyway as it didn’t look as though it was well driven. As it turned out, there was a tree blocking the road farther along, and there were other spots where it was clearly growing over from disuse. But it made for a pleasant enough walk until the road was bisected by a creek. At this time of year it wasn’t too hard to ford the creek, jumping from rock to rock, but when the water is higher in the spring, it might be necessary to head upstream to find a narrower crossing than I took. Not too long after traversing the creek, the slope on my left went uphill, rather than downhill toward Coal Creek as it had done until then. I knew this meant I’d come to my destination at last! Looking north across the rocky slope.